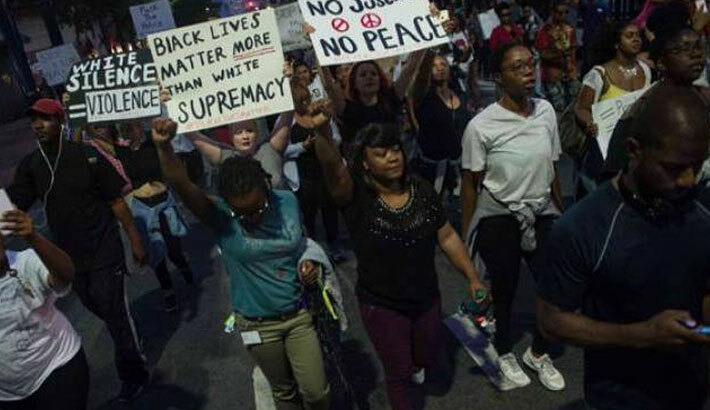 CHARLOTTE: A second night of race-related clashes in Charlotte, North Carolina on Wednesday left one protester on life support, with the renewed violence prompting the governor to declare a state of emergency, reports AFP. Governor Pat McCrory said on Twitter that along with declaring the state of emergency, he was activating the National Guard and Highway Patrol officers to assist local law enforcement. “We cannot tolerate violence. We cannot tolerate the destruction of property and will not tolerate the attacks towards our police officers that are occurring right now, and I feel very strongly about that,” the governor later told CNN. Several hundred people taunted riot police Wednesday night amid clashes in the city center, a second night of unrest ignited by the fatal police shooting of a black man. A protester was critically wounded and on life support, the city said, after earlier reporting that the person had died. Authorities had said the protester was shot by a civilian, adding that police did not open fire. An AFP reporter at the scene of the protests outside the Omni Charlotte hotel saw a man who was apparently shot falling to the ground, bleeding heavily. Some demonstrators banged on windows, others stood on cars and threw objects at police. Police fired what appeared to be tear gas, sending the protesters scattering. “We are working to bring peace and calm to our city. We know this is not who Charlotte is,” Mayor Jennifer Roberts said on CNN, calling on people to stay home and off the streets. “Tell everyone that violence is not the answer,” she said. Sixteen officers and several demonstrators were injured in clashes overnight Tuesday following Scott’s death, the latest in a string of police-involved killings of black men that have fueled outrage across the United States. Charlotte police tweeted that four officers were hurt during the second night of unrest Wednesday night, but said none of the injuries were considered life-threatening. Before Wednesday’s protest, presidential candidates Donald Trump and Hillary Clinton weighed in on the violence in Charlotte, which came on the heels of another fatal police shooting of a black man, Terence Crutcher, on Friday in Tulsa. “Keith Lamont Scott. Terence Crutcher. Too many others. This has got to end. -H,” tweeted Democrat Clinton, signing the post herself.